The return on investment in nutrition is high. So why are we failing to adequately invest in it? On average, for every dollar that governments around the globe invest in nutrition to reduce stunting, they see a return of 16 dollars in terms of sustainable development. (17th Feb 2015) – The Scaling Up Nutrition Civil Society Alliance (SUN CSA) launches today at the Summit Parkview Hotel from 9:00am to 12:00pm, calling on civil society organisations to join the movement to eradicate malnutrition in Myanmar. On Red Hand Day, or International Day against the use of child soldiers, Save the Children celebrates the dedication of social workers that support the reintegration of children discharged from the Myanmar armed forces. Zayar Sit Naing, 12, learns to stand up for child rights as a member of Save the Children’s child protection program. “I have been in the group for two years. I found it very interesting as we learn about child rights. Domestic violence happens a lot in my community,” said Zayar Sit Naing, living in Hlaing Thar Yar village, Yangon, Myanmar. Zayar Sit Naing joined Save the Children’s child protection group two years ago, after his mother became a volunteer of the program. “Once there was a five-year-old girl who was attending the early childhood care and development centre. If she could not wake up on time in the morning, her mother would beat her. 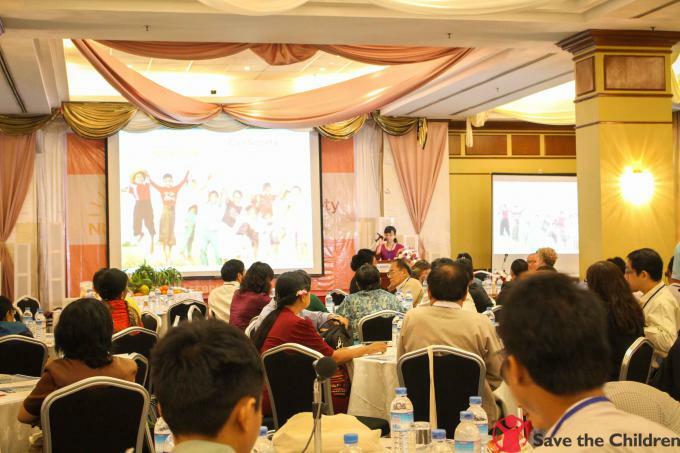 Save the Children in Myanmar and the Department of Social Welfare hosted the 2014 children’s forum on Sunday, 14 December, where 80 children from around the country made their recommendations to the Government of Myanmar to invest in their childhoods and future. The event was held at Yangon International Hotel in Yangon, with Members of Parliament, Department of Social Welfare, Yangon Child Rights Committee, National Child Rights Committee, Business Associations and international non-government organisations present.